A South Korean envoy walks with North Korean leader Kim Jong Un during their meeting in Pyongyang. 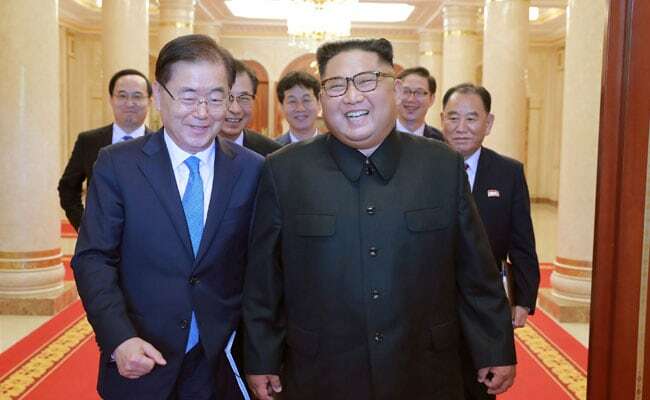 North and South Korea have agreed to hold a summit in Pyongyang on September 18-20 to discuss "practical measures" toward the denuclearisation of the Korean peninsula, a senior South Korean official said on Thursday. North Korean leader Kim Jong Un "reconfirmed his determination to completely denuclearise" the peninsula, and expressed his willingness for close cooperation with South Korea and the United States in that regard, the South's national security adviser, Chung Eui-yong, told reporters a day after meeting Kim in Pyongyang. Kim told South Korean officials that his faith in U.S. President Donald Trump remains "unchanged" and he wanted to realise denuclearisation and end long-standing hostile relations between the two countries during Trump's first term, Chung said. "Chairman Kim ... expressed frustration over the doubt shown by some parts of the international society about his will," Chung said. "North Korea has been preemptively carrying out measures needed for denuclearisation, and Kim said he would appreciate that such good faith is accepted with good faith." South Korean President Moon Jae-in sent Chung and other envoys to the North Korean capital on Wednesday to set the timing and agenda for the third inter-Korean summit this year, and to break the impasse in talks between Washington and Pyongyang over dismantling the North's nuclear programme. Kim and Trump held a watershed summit in June in Singapore and pledged to work toward denuclearisation of the peninsula. But their nuclear talks have since been on shaky ground, with both parties accusing each other of not meeting their commitments quick enough, especially after Trump called off U.S. Secretary of State Mike Pompeo's trip to North Korea last month.